So, Covent Garden is a citrus (orange and lime, heavy on the lime) with a little kick of ginger and pepper at the top, a few sheer (and still peppery) rose petals in the heart and a soft iris + carrot over a dry woody musk in the base. It's not terribly rooty, bearing in mind that my tolerance for rooty is surely significantly higher than average. I would call it a unisex citrus or a unisex iris, or both. That lasting power is decent. Verdict: As I said in the Jack review, I like Richard E. Grant. I like reading his interviews, and even his olfactory prejudices amuse me.1 And I like Covent Garden. It's quite pleasant, and it would make a decent no-brainer summer citrus / iris. 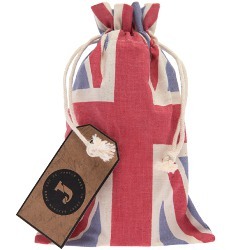 I'd absolutely wear it if a bottle dropped from the sky, and I'm sure I'd find a good use for the drawstring bag, too. But I'm not wild about Covent Garden, and most of the fun is in the first 15 or 20 minutes. After that, it's a little too muted for my taste, and it mostly reminds me of other, similar, fragrances I like better (anyone remember Curated by Colette Three AsFour? ), or of things I might layer on top to give it a little more verve after the opening fades. If I had a choice between a bottle of Jack or Covent Garden, I'd take Jack in a heartbeat. 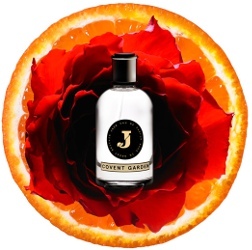 Jack Covent Garden was developed by perfumer Aliénor Massenet. It is $135 / £95 for 100 ml Eau de Parfum at Aedes, Luckyscent or Liberty London. 1. He hates Thierry Mugler Angel, and tells Manchester Confidential that "If somebody is eating chocolate and cheese I have to leave the room" — this is why I never invite Richard E. Grant to lunch. My lunch 9 days out of 10 is apple + cheese, followed by tea + chocolate. I eat the same lunch day after day. I call it my “automated automatic lunch program.” No brain work necessary. I keep it on repeat until I’m over it. Currently lunch is a slice of toasted sprouted whole wheat bread with avocado and tomato plus an apple and a square of dark chocolate. Ah. So perhaps he can stand the smell of one or the other, just not both? Continuing the food theme, at first glance I thought the image above was a pizza with a perfume bottle on top. Well, you can sort of imagine a pizza-ish thing being served up with a bottle of something spicy or aromatic to sprinkle over the top. I don’t frequent that sort of restaurant but surely they exist. Sorry Richard. Perfume sounds great. Thank you for reviewing these scents. I hope they are successful. Mr. Grant is utterly charming in a slightly devious but somehow guileless manner, and I am smitten by the charming scented world he has created – the actor-waiter story, the hanging tag, and that bag. (want!) Chances are slim, but I hope I’ll get to pass my nose over the Jack fragrances some day. Have been managing to keep up with articles/comments despite being a tad busy in Tampa & Texas! ‘Mine host’ has not yet commented on how delicious I smell – will have to give him a mega blast of Privet Bloom tomorrow at the family plus me get-together for their twin sons’ 29th birthday – his appreciation during past visits for Bluebell & Fleurs de Bois was spectacular! Am a big Richard E Grant fan, & love his take on smells, food etc., so will look forward to trying his range on my next London jaunt, December definitely, but possibly a side trip before then. Do report back if you get to try the Jack scents, and enjoy the rest of your trip!